"We tell people they don’t have to live with their pain. We offer proven treatment options,” explains President and Medical Director, Dr. Michael Steuer. “It all starts with the right diagnosis. 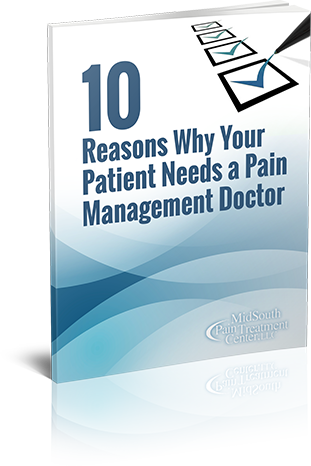 There is no room for guesswork when it comes to effective pain management." Before founding MidSouth Pain Treatment Center, Dr. Steuer earned his medical degree from the University of Michigan, and completed his Residency and Fellowship in Anesthesia at Harvard Massachusetts General Hospital. Meet our triple board certified physician, Bradley W. Wargo, D.O. How well do you know the risks of long-term opioid use? MidSouth Pain Treatment Center is recognized by Memphis Business Journal as a Top Surgery Center! What are you suffering from ? This is not an all-inclusive list. If you suffer from a condition not represented, contact our office and ask if there is something we can do to help you. Watch Tammi's story about how she found relief from years of chronic pain. Watch Glendon's story about how he got his life back through interventional treatments. Watch Reginald's story about how he found relief thanks to our caring Oxford Team. Dr. Michael Steuer and the Jackson, TN Clinic were featured on WNBJ Nightly News in Jackson!